Africa had always been included on our round-the-world trip itinerary but it wasn’t until June that we made any plans for what we’d actually do there. We booked a 19 day overland tour starting in Cape Town, South Africa, traveling through Namibia and Botswana and ending in Livingstone, Zambia. A traveler we met in the Philippines summarized Africa by saying that one day you’d love it and the next day you’d hate it. During our first 72 hours on the continent we decided that no truer words have been spoken. We moved at a pretty frantic pace for the first four months of our trip, rarely staying in one place for more than a few nights. As our drive through Africa would be even more fast paced we planned almost two weeks of down time in Cape Town before the start of the tour. We arrived after 24 hours of travel from Nepal, including a nearly sleepless overnight stay at Doha airport in Qatar. On our approach the setting sun bathed Cape Town in a beautiful orange light, and despite our weariness we were excited for a new city, a new country, and a new continent. We’d prearranged an apartment and could hardly wait for a rest from the road in our own space. Things took a turn for the worse as soon as we arrived at the apartment. Ringing the doorbell twice failed to illicit any response, possibly because it wasn’t heard over the screaming inside the house. Our esteemed landlord, Liezel, finally appeared after Allison yelled in through the door, left wide open in a city where everyone has a security fence and keeps it locked. She showed us to the apartment, which was smaller than many hotel rooms and no better appointed. The kitchen, with a single bowl sink, small refrigerator, and microwave was crammed into the hallway between the bathroom and living area. There was barely enough room for one person to cook, much less two. Worse still, the apartment wasn’t even ready even though we’d arrived three hours late. Liezel said that the previous tenant, an American visiting for the World Cup, had smoked in the apartment so she’d steam cleaned the mattress and carpet. She understandably hadn’t made the bed because the mattress wasn’t dry but we weren’t quite sure why there were clumps of dust scattered over the supposedly clean carpet and why the bathroom hadn’t been cleaned at all. There was dirt – actual soil, not just dust – on the bathroom floor. Liezel left to find linens for the bed and after half an hour hadn’t reappeared, so we again called into the house. She returned noticeably agitated and without linens. When I asked whether she was planning to finish cleaning the apartment she launched into a tirade about how Americans, present company in particular, are arrogant and expect first world service in a country that in many ways still resides in the third world. Although not necessarily an untrue statement about many parts of the country, I decided it would be best not to point out that we were in the middle of a modern city, that South Africa had just hosted a major international sporting competition without incident, and that all we wanted was a clean bathroom and a set of sheets. Her rant culminated with a suggestion that we leave and might instead prefer to pay more for a “filthy hostel downtown”. After generously refunding our security deposit she called us a taxi and we left somewhat flustered but mostly bewildered by this strange welcome to Cape Town. Our first night in the city we found out just how cold Africa can be. Although the temperatures probably hadn’t fallen much below the mid forties, it felt much colder in our drafty, unheated hostel. We kept warm with the fake Marmot sleeping bags we’d purchased in Nepal for our overland tour, as well as with the knowledge that we were actually paying lower rates than at witch Liezel’s. The next morning we woke to pouring rain and after choking down the free hostel breakfast, sprinted to an internet cafe with hopes of finding a new apartment. Fortunately our luck started to turn after a couple of hours of research. We emailed about several promising options and by late afternoon we’d visited an apartment that was three times the size of Liezel’s lair of despair and also less expensive. We moved in the following morning. 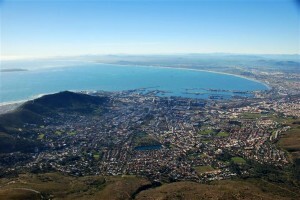 Despite the rough start the rest of our time in Cape Town was precisely the break from the road we’d sought. We reveled in normally mundane domestic tasks like doing laundry, shopping for groceries, and cooking our own meals. While it was tempting to never leave the Fortress of Solitude, we made sure to occasionally emerge and explore the city. We visited the District Six Museum, which commemorates a once vibrant neighborhood from which nonwhite residents were forcibly removed in the 1970s as part of South Africa’s apartheid policies. Over 60,000 people were moved to less desirable land 25 kilometers away and most buildings were bulldozed. Facing international pressure the government’s plans to rebuild the area never materialized and today much of the land is still undeveloped. The District Six Museum was one of many reminders that South Africa is a young and developing country that retains deep scars after many years of discriminatory policies including almost 50 years of apartheid. 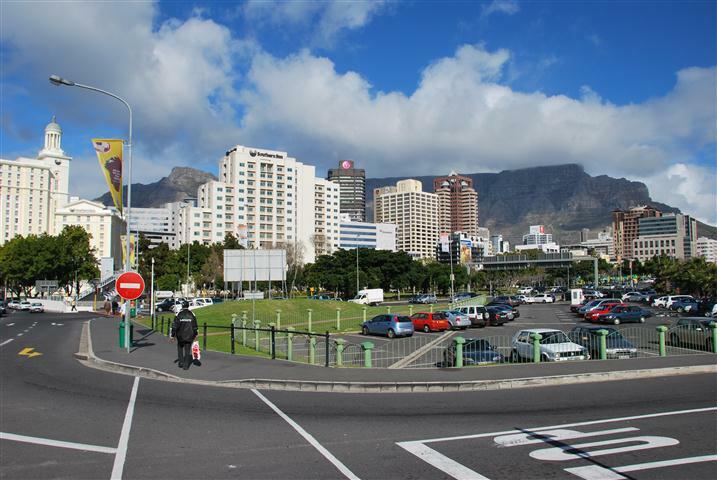 Looking outside our apartment we could see flat-topped Table Mountain, one of Cape Town’s most prominent landmarks. When the clouds cleared on our first morning in the apartment we wasted no time to set out for the summit. We made the 1000 meter ascent in about two hours and were rewarded with dramatic views of the city. Another day trip ferried us seven kilometers off the Atlantic coast to Robben Island, where Nelson Mandela was imprisoned from 1964 to 1982. We explored further afield by procuring the cheapest, most minute and underpowered rental car on offer. Driving on the right and shifting with my left hand, I cautiously piloted the vehicle out of the city and east towards Hermanus, a route famous for whale sightings. The drive was beautiful although we didn’t see any whales, with the exception of a single, fleeting dorsal fin. On our second day with the car we drove south, stopping to sample some South African wine before spending a few minutes enjoying the novelty of a warm and sunny white sand beach in the middle of winter. After nine days in the apartment we hauled our backpacks out of the closet and packed up. We’d enjoyed the tranquility of our own space in a modern city. 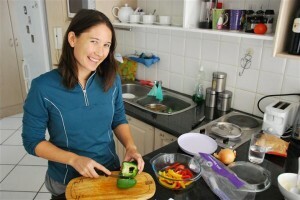 Cooking our own meals was a welcome change after several months of eating in restaurants. The front loading washing machine cleaned our whites whiter than ever before. We left the apartment shortly after sunrise on July 24th, apprehensive about boarding an overland truck for three weeks of a decidedly different lifestyle, but eager to see more of Africa.